We are pleased to offer all our visitors, clients and non-clients alike, free use of a professional, online team effectiveness measurement tool – the Sandstone Team Effectiveness Report. You input the team name, we send you the links for your team members to input their responses and for you to access the detailed report our system automatically generates. The Sandstone Team Effectiveness Report is easy to complete as a respondent, completely online and free. 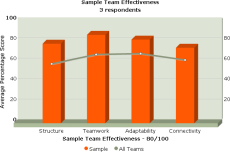 It offers a combination of an easy to understand 3D bar chart of the 4 key team effectiveness elements and a detailed report on the 40 statements that make up this comprehensive team report. Teams can complete it as often as they like to track trends in their behaviours and effectiveness. Clients of our team building options can use it both pre and post events to measure the effect that our team building has on a team, In fact any team can use it as often as it wants for whatever purposes it wants. Ask every respondent to print out their responses before submitting them and get them to bring their printouts to the session. Take each statement in turn. Firstly, ask “is this statement important?” No team will find all 40 statements of great importance to it. If the statement is not sufficiently important to your team, move onto the next one quickly. Assuming the statement is important, check the range of responses. If the lowest is 80%, the team clearly thinks it is good at that point. Challenge that assumption to be sure the team is not suffering from collective rose-tinted glasses syndrome. If the positive view survives the challenge, indulge in a quick round of back-slapping and move on. Other statements are likely to be of more value. Note where the average score is. It gives a feel for how skewed the responses are towards the low and high ends of the scale. If everyone has (or most have) scored lowly (60% or less) the team is in general agreement that it could do better at this point. Since it has already been decided it is important, this is one worth exploring to see what can be added to the action plan to generate a team improvement. If the range is wide (e.g. 20% to 80%), there is a disagreement on how good or otherwise the team is at the focus of this. Such statements are extremely valuable as they show up some kind of split in the team. Explore the reason for the wide differences of opinion and again seek ideas on what to write into the team action plan to improve every team member’s view of that point. One good way to open up the discussion is to ask one person who scored it highly to explain why they did so and one person who scored it lowly to do likewise. This process really can stimulate a great discussion. At the end of going through all 40 statements, review the action plan and pick out 3 things that are “quick wins” and 3 things that are “important wins” and focus on those 6 things. The former can help team spirit as team members see immediate benefits from things that can be easily fixed. The latter are vital to really maximising the team’s performance improvements.